Five months and two days have passed since you left me behind. This is how I count out the days since your death. The days before were filled with periods of uncertainty but also with hope. The roller coaster ride of your addiction was starting to slow down allowing me to catch my breath and dream of a peaceful future for both of us. The years of struggling had taken its toll and we needed a break. I Look back now and realize how foolish I was in thinking we had outsmarted your demons. Florida was supposed to be a new beginning but all we got was an ugly ending. Spring is finally here. My gardens are coming to life. The days are sunny and warm. I keep hearing that life goes on. That it’s been and I should be. No one seems to understand that I am living in an empty shell. My heart remains in pieces. The woman I was died with you that cold January morning. The words still echo in my soul, “It’s Matt. He’s dead”. That memory stuns my heart and stops me in my tracks. I close my eyes and all I see is your smiling face. 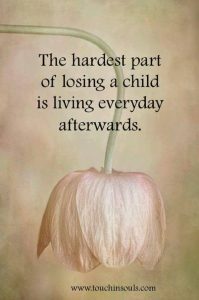 I’ve read that the loss of a child does not just destroy the parent but demolishes them. My life has suffered from the result of that demolition. I am no longer that smart girl. No longer able to bounce back and be the fixer. I am broken and even I can not fix myself. I am no longer that NICU Nurse. Nope. I just couldn’t put the pieces of myself back together fast enough so the hospital let me go. Thirty six years and all I got was a kick out the door. I look back and wish I had spent those weekends and holidays with my family instead of taking care of another family. How I wish I gave less to my profession and more to my family. We have this false sense that we will always have one more. One more birthday, one more Christmas, one more chance to say I love you. How foolish. So now I’m unemployed. How ironic, I used to dream about the day I could retire. Oh how I looked forward to having time. No more working weekends or missing holidays. Just precious time all to myself. Time to spend in my life, not running the rat race. Now time has become something I crawl through. There is a saying that time heals all wounds. People tell you to give it time. Time will help. As if time has the magical power to help you forget your child is gone. All time has done for me is to deepen my pain. Time passes and I realize I haven’t heard your voice or seen your face. Time is not my friend. Time is a painful march of birthdays, holidays and special days that are no more. Time deepens the grief as my new reality seeps in and I realize this emptiness will be a part of my soul forever. Days have turned to weeks and weeks to months. Time marches on and with each day I must learn to survive. Knowing there will be no more phone calls, no visits to see your life in Florida. No Matt coming home for Thanksgiving or Christmas. Time is a painful reminder that there will be no more. A crack that started small is now an abyss that swallowed my soul. Before your death, I wanted time to slow down. I complained that it was going by too quickly. Days and months were flying by. I wanted time to give me more moments to enjoy life. To enjoy your recovery. To enjoy moments between a mother and her son who survived the ultimate challenge. To enjoy a bit of normal in our chaotic world. I wanted the change of seasons to last longer allowing us more time to savor the beauty we had missed during your struggle. I wanted to make up for the time we lost fighting your demons. I wanted time to see your beautiful, clear eyes. I wanted time to smell the roses together. To walk by the sea laughing like we had not a care in the world. Working and fixing you took every second of everyday. My mind always on overdrive. Spinning with plan A, B or C. Always trying to be one step in front of your addiction. Now, time can’t move fast enough. I want the holidays to fly away and be gone. Birthdays too. I want time to fly making my head spin away from my reality and the pain it continues to bring. My grief has ended a nursing career that spanned 36 years of my life. Time is now something I have plenty of. Something I try to fill everyday. The void left by your absence has shattered my very core. Your death hit me like a bucket of ice water. Taking my breath away and putting me into a state of shock. Time has also taught me a lesson. I have no control over it and what it may bring. We’ve all heard the saying, “In God’s time not ours”. Now through my grief I understand. Time does not belong to us. Time, however long or short is a precious gift. For now, I will use this time to remember you my beautiful boy. I will let my tears flow at will. I will scream into the wind on a cloudy beach. I will run into the surf, close my eyes and remember. I will continue to tell your story. I will hold you in my heart forever. I will have conversations with God asking questions only he can answer. I will use this time to remember my blessings. I will use this gift of time to start healing my heart and soul. This gift of time is a double edge sword. I have no choice. You are gone and I am left behind to find my new normal. One step, one day, one breath at a time.